"Although the Wakefield Rattan Company was best known for first manufacturing rattan into skirt reeds and baskets, and later into cane for chair seats, chairs, car seats, cradles, flower stands and a host of other diverse items, the company also made rugs at the Water Street site. When Cyrus Wakefield bought the land on Water Street in 1855, just east of the Center Train Depot, the site consisted of a few small buildings, including Green's grist mill, and two mill ponds. The company continued to grow over the next two decades, factory buildings were added, and the Wakefield Rattan Company was organized in 1873, just a few months before Wakefield's sudden death. At the time of his death, the manufactories and storehouses covered an area of 10 acres of flooring, and more than 1,000 men and women were employed. Although the company lost many of its original buildings in a fire on March 12, 1881, the rebuilding was swift and the company continued to thrive. There were five main four-story brick factory buildings. Building number four was used exclusively for the weaving of rugs and mats, and for storing of dyestuffs. There were approximately 30 factory buildings on the 11-acre site during its heyday. the company merged with Heywood Brothers and Company and the Heywood and Morrill Rattan Company in 1897 and became known as the Heywood-Wakefield Company." - Text from calendar by Jayne M. D'Donofrio. Photo courtesy of John Neiss. 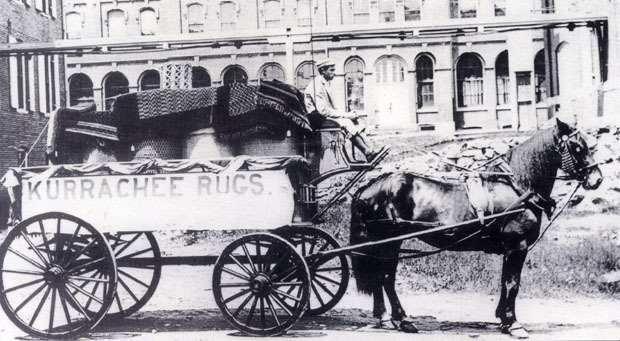 “Kurrachee rugs, Wakefield Rattan Company, Arthur Dulong, driver, circa 1890s,” NOBLE Digital Heritage, accessed April 20, 2019, https://digitalheritage.noblenet.org/noble/items/show/6997.